Home » A HAPPY HOME » What Do Scary Things Do? My almost four-year-old eyed me and then quickly redirected his gaze to his toys. His tone was apologetic. Benjamin’s fear of spiders wasn’t new to me. 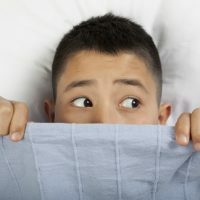 For a while, he had recurring nightmares involving spiders—the kind of nightmares that would terrify the most fearless adult. I blinked. When is this kid going to start asking me easier questions? I imagined a gathering of all the things my children might fear: Spiders. Monsters. Darkness. Storms. Snakes. Strangers. The things that my children shrink back from, or that make them cry out in the night. All things that represent insecurity or the unknown. And then I imagined those things cowering in fear before a holy and all-powerful God. I told Benjamin that everything God has created submits to him and obeys him. Which means even the biggest, creepiest spider is no match for our God. Benjamin considered my response. “Oh,” he said. “That’s pretty cool.” Satisfied, he went back to his toys. But I couldn’t get his question out of my head. What do scary things do when they see God? I once again pictured the Gathering of Fears. The spiders and snakes are huddled together in one corner. Monsters lurk in the shadows as their rattling breaths pierce the thick silence. Storm clouds churn overhead while strangers with their darting eyes roam nearby. The mental image was creepy, one that I knew would terrify my son. And then I wondered—what terrifies me? The Gathering paraded before my mind’s eye again. Only now, in the dark corner where the spiders and snakes once lived, the terror of losing my children hovers. Where monsters once lurked, there is now the anxiety of the unknown. And where storm clouds churned, there is now a thick fog of loneliness and depression that threatens to choke the air from my lungs and the light from my eyes. My reassuring words to Benjamin were enough for him. I couldn’t help but wonder if they were enough for me. “If God is for us, who can be against us? Who shall separate us from the love of Christ? Shall tribulation, or distress, or persecution, or famine, or nakedness, or danger, or sword? For I am sure that neither death nor life, nor angels nor rulers, nor things present nor things to come, nor powers, nor height nor depth, nor anything else in all creation, will be able to separate us from the love of God in Christ Jesus our Lord” (Romans 8: 31,35,38). Everyone’s afraid of something. But if I am in Christ, my fears have no dominion over me because my heart and my eternity are sealed by the blood of Jesus. No loss, no anxiety, no loneliness, no depression—and no spiders—can ever separate me from the love of Christ. They bow on bended knee before my Heavenly Father. By: Mary Holloman is the wife of one husband and mom of two stinkin’ cute kiddos. When she’s not preoccupied trying to keep her kids alive, she works and writes for Greensboro Pregnancy Care Center, destroys her husband in ping-pong, and then writes some more. Visit her at www.maryholloman.com and follow her on Instagram at @marytholloman.